Villa Franca Design and Development has been building custom homes for satisfied customers throughout South Florida for over 25 years. A new home purchase will probably be the single largest investment one will make in a lifetime. Imagine having the freedom to design a custom built home at a truly affordable price. At Villa Franca, we listen to our customer’s needs and desires in relation to style, size and layout. Our homes are designed with structural superiority by using only the best quality materials. Total focus is then applied to the detail of workmanship of each new home. 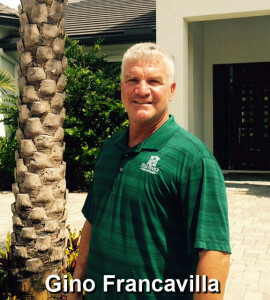 Gino Francavilla, the owner of Villa Franca, stands by his name and takes personal pride in his product. In Italian Villa Franca means “Estate Freedom” and that is our focal point. Being free from shortcuts in the development of your home and free from oversights or blemishes in the details of your home. In addition, we have the freedom to get our homeowners personally involved with the design, decor, and development of each new home. Unlike dealing with a production home company – you the home buyer can take part in the development of your new home from drafting-board to housewarming. You can have the freedom of designing floor plans that would accommodate your specific lifestyle. Or, if you choose, you can leave all of the details to our experienced professionals. Villa Franca has satisfied customers throughout Palm Beach and Treasure Coast. Our recent custom residences include Hidden Bridge, South Fork Estates, Osprey Ridge, Nativa, Seminole Landing, Jupiter Inlet Colony, River Ridge, Heritage Oaks, Cypress Point, Palmwood, and Reach Island. Compare our homes to any other in the market, we are confident you will recognize the value and quality of a Villa Franca custom home.